Tracy – Tracy is our office manager and insurance liaison. She is primarily responsible for the back office work which can be anything from marketing, payroll, insurance issues, accounts payable, etc. She has been with PEC since 2001and has a great rapport with our patients. She is also a registered pharmacist in the State of Arizona and received her BA in Pharmacy from Auburn University in Auburn, Alabama. She has been married since 1995 and has 2 daughters – Kylie and Cori. She enjoys camping, hiking, gardening (makes good pickles), spending time with her family, and traveling. She brings a lot of customer service experience to our team and some Southern charm. Carrie – Carrie is the youngest of two children and has lived in the Prescott area for over 20 years. She married her high school sweetheart (David) in 1993 and they are proud parents to two daughters Haven and Kadence. Carrie joined the PEC family in April of 2011 and loves getting to know all of the wonderful patients who visit us daily. Lucy – Lucy is our lead Licensed Optician with over 30 years’ experience in the optical field. She has served on the Arizona State Board of Dispensing Opticians including the office of President. Lucy is a native of Arizona and has lived in the Prescott area with her husband Elzie since 1997. They enjoy the antics of their beagles Oliver and Sophie. In her free time, Lucy enjoys making jewelry and gardening in between trips abroad with Elzie. Stacy – Stacy is a self-described “Arizona transplant” by way of Alabama, Wyoming and Montana. She now loves calling Prescott her hometown. Depending on the day, Stacy can be found just about anywhere in the office. She has been married since 2002 and has two children: Lilly (2007) and Robert (2012). Marla – Marla is the front desk coordinator for PEC. This allows her to meet and greet our greatest asset, our many wonderful patients. Marla moved to Prescott from California in 1987 and has never looked back. She has been married to Dan for over 30 years. Together they share two children and “four of the world’s greatest grandchildren.” She enjoys gardening, taking care of her pets, running, and most of all motorcycle trips with Dan. Vicki – Vicki has over twenty-five years of optical experience and loves helping patients not only see great but also look great. Along with her husband of 30+ years, Tony, they have two children and five grandchildren…even though they are “too young for grandkids.” As an Arizona native, she enjoys cooking, gardening and backyard get togethers with friends and family. Sami – Sami is a Prescott native who joined our team in 2014 and is proud to be our lead doctor’s assistant. She loves learning new things on the job daily. She loves nature, food, dogs, and her son Damian. Hannah – Hannah has lived in Prescott twice for a total of seven years and counting. Of the many states she has lived in, she is thankful to call Arizona home. She married her middle school sweetheart in 2017 and together they are excited to raise a family in the beautiful Prescott area. Charlea– Charlea has been in the eye care industry for over 5 years now and moved from the Phoenix area to join our practice in 2017. When she’s not in the office, you can find her camping and exploring northern Arizona with her German Shepherd Oliver. Shawnee – Shawnee is one of our optical specialists who is passionate about continually learning. When not focused on the eyes, he is focused on the ears. He plays multiple instruments in multiple bands around Northern Arizona after earning a degree in Classical Composition from the esteemed Berklee College of Music in Boston. He loves long walks on the beach and getting caught in the rain…so Prescott is a natural fit. Hallie – Hallie began her time at Premier Eye Center as a patient. When other doctors could not get her eyes figured out, it was Dr. Bundy who diagnosed Keratoconus and fit her in specialty scleral lenses. Now she helps train other patients on how to wear scleral lenses. She is a proud dog mom to her toy poodle, Opie, and enjoys traveling and the great outdoors. T.J. – T.J. is a Prescott native who has returned to his roots after earning a Bachelor’s degree in Biology from the University of Arizona. He loves putting together the book knowledge from school with the real world experience here at Premier Eye Center. When he’s not learning about our amazing eyes, and helping others take care of them, he fills his time with too many activities to list. T.J. is also passionate about giving back and helps coach youth basketball at the YMCA. 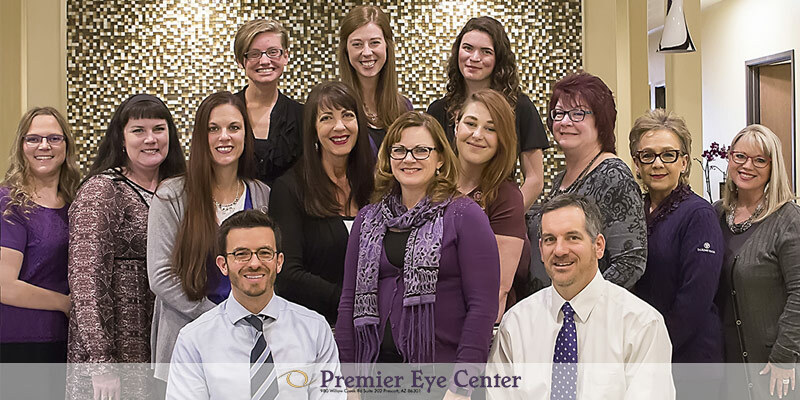 "The mission of Premier Eye Center is to develop long term relationships with our patients in order to better serve their visual and eye care needs for a lifetime." "Thank You Dr. Jonathan Bundy for your care and concern, I owe my health and possibly so much more to your diligent and caring personality. This experience will resonate with me forever."